The big bad boss man has arrived, and he is not happy! Motormaster's here to show the Stunticons how it's done! Read on to hear my thoughts! Let's get this out in the open right off the bat. Motormaster is a clear repaint/retool of CW Optimus Prime. However, I feel like the mold really shines as Motormaster and really fits his character far more than OP. Motormaster is sporting almost entirely remolded outer shell parts with a different grill, different side panels and front bumper and wind vane parts that are not present on the Optimus version of this mold. His proportions are meaty and powerful looking, though he is lacking the trailer that his G1 counterpart is known for. His Rims and some of his other molded details could definitely use some paint to really up the wow factor of this toy. He rolls well and feels solid when everything is tabbed in. He does look a little bit small next to his fellow Stunticons in vehicle mode but he doesn't look too out of place and they make for a great team display. Motormaster looks every bit a Decepticon in his robot mode. With a huge broad chest and wide shoulders, and a giant Decepticon badge dead center on his chest, there's no mistaking this guy for an Autobot. His bot mode is huge and chunky and really sells him as the leader and torso of a combiner team. His head takes some liberties from the G1 design but he still has his trademark "box" head and a fearsome scowl spread across is face. His grey and black deco is broken up with cleverly placed bits of Decepticon purple and much like his vehicle mode a little more paint certainly would go a long way to help this guy. For the most part he is fairly solid with very few hollow spots, though due to his transformation scheme he is a little thin front to back around the midsection. He looks his best head on and any view of him from the side will quickly shatter the illusion of his size. He stands tall and stern above his fellow Stunticons and looks great as their leader. I love the head sculpt and the stark contrast in details between Motormaster and OP really sell this mold to me as Motormaster (Prime not so much). His posability is decent but nothing to really write home about, he has a waist swivel, but no wrist swivels (a cardinal sin for a sword wielding bot). I find he really looks his best just towering over smaller bots and dwarfing them with his football star proportions. Motormaster comes with his trademark sword and a generic silver blaster. The blaster and sword can be combined to form a larger sword that is primarily used for combined mode but isn't so big to look out of place in the hands of Motormaster. The "blaster" isn't all that convincing to me so I tend to leave his sword combined in both modes. It would have been nice to see him ship with a G1 style blaster but I'm sure someone out there in 3p land will fill in the blanks for those who really want more out of Motormaster. My only real complaint with the sword is that it's full of holes, in a design choice made to resemble tech detail but really just serves to remind me how much Hasbro will try to skimp on plastic when possible. A solid sword more G1 inspired would have been a nicer looking option but for what it is there's not much to whinge about. His sword and gun can clip together and peg into his truck bed for storage in alt mode. On the whole Motormaster comes together fairly well and really shines in a mold that so far had felt less than impressive. This mold really screams Motormaster to me so much so that I'm certain OP was the after thought to milk the mold. He looks great with his fellow Stunticons and even has the aesthetics to fit in to a neo classics/CHUG collection if you aren't into the Combiner Wars gimmick. His weapons work well with his design, even if a little cheaply produced, and his paint and deco applications are impeccable. I'm definitely impressed with him, but I wouldn't put him top of my list when it comes to Hasbro mainline releases... he rests somewhere comfortably in the middle. I would definitely recommend picking him up if you are a fan of the Stunticons, plan on completing Menasor, or even just interested in seeing the Combiner Wars OP mold done right. Check out the gallery below for more photos of Motormaster in action, and stay tuned for my next review! 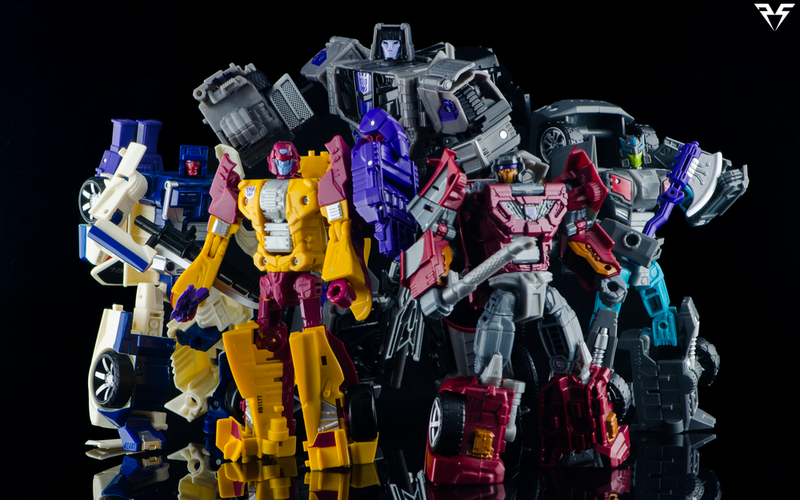 The Stunticons will be combining forces and we'll take a look at the Mighty Decepticon Gestalt, Menasor!